So what would it be like to fly a two bladed helicopter that wasn't "underslung"? It would need a heavy, strong yoke to absorb the forces. Do you understand why a 2-bladed semi-rigid rotor is underslung? Isn't it to counteract the Coriolis effect which would normally force the advancing blade to rotate faster since flapping up would bring its center of mass closer to its axis of rotation if it wasn't underslung? I guess I'm not sure what that DOESN'T have to do with the Coriolis effect. The Coriolis effect has to do with the conservation of angular momentum. Does that help or do you need another hint? "It would need a heavy, strong yoke to absorb the forces." 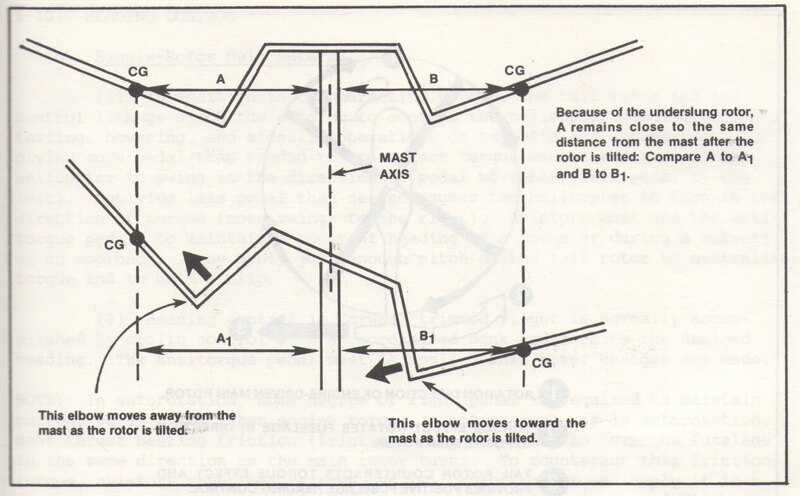 All rotors generate vibrations as a function of the in-plane forces. Coupled flap-lead-lag motion (Coriolis) is an additional in-plane blade force along with the blades inertial force, centrifugal force, and aerodynamic force. These forces and vibrations can become a problem unless somehow suppressed, balanced, damped, absorbed, or eliminated. The in-plane stiffness at the hub and blade root has a pronounced effect. If the in-plane flexibility is tuned above one-per-rev (1.2 -1.5 per-rev) we can attempt to duplicate the effect of appropriate underslinging. We could also reduce flapping thus Coriolis effects by placing the pitch link/pitch horn connection so it’s offset from the flap hinge axis. This is similar to what’s used on tail rotors to avoid having to use lead-lag hinges, delta-3 hinge offset. In other words, as in Eric Hunt’s post above, we’re likely adding on more weight and cost and the oscillatory outcome may still be less than underslinging. Edited by iChris, 14 October 2018 - 23:20. Most likely an unacceptable rotor vibration levels would be the case; however, unless you were a test pilot, most any helicopter that you’ll get your hands on, underslung or not, has already passed certification were vibration levels have been deemed acceptable. Whatever you do you’re not going to completely eliminate rotor vibrations. AC 27.251. § 27.251 VIBRATION. appropriate speed and power condition (rule statement). control or stabilizing surfaces and rotors. Edited by iChris, 03 October 2018 - 04:35. Well, the advancing blade isn't flapping up, it is flapping down, which is why the disc is tilted forward. People seem to get hung up on the "flapping to equality" bit, which only happens if the disc experiences a gust of wind, and there is no cyclic input. That makes the front of the disc tilt back, and the aircraft will move backwards. Now the relative wind is from the rear, the disc flaps forward, the aircraft reverses direction, and in one or two more of these cycles, it crashes. Feed in some forward cyclic to (a) stop the flapback and (b.) keep the aircraft moving forward, and there is no longer any flapping to equality - killed off by cyclic input. The problem with Coriolis begins on the retreating side, which IS flapping up, and (also because of coning) is "apparently" getting shorter, when looked at from vertically above the mast. Shortest is at the back, longest at the front. Conservation of angular momentum will make the "shorter" blade across the back of the disc want to turn faster, and the "longer" blade want to turn slower, putting both blades on the right side of the disc. Bad news. Underslinging helps to reduce this effect by moving the rear blade further away from the mast, and bringing the front blade closer in to the mast. Edited by Eric Hunt, 01 October 2018 - 18:24. The whole series of Helicycle engineering videos is pretty great. The rotor system tilts about the point (P) which is offset beneath the rotor plane, or point (Q). This results in an "overslung" rotor system that requires less rotorshaft length and which produces less shaft movement than a comparable "underslung" system. I am curious about the tradeoffs involved there. Not much info on "overslung" rotor systems. Well, the advancing blade isn't flapping up, it is flapping down, which is why the disc is tilted forward. Up relative to the "disc" as you call it, not relative to the fuselage. So, what are you trying to say here? Do you still think the blades are "flapping to equality", and the advancing blade is flapping up? If it is flapping up, why is it at its lowest at the front? Why is the swash plate taking pitch AWAY from the advancing blade, and adding it to the retreating blade? It is to stop the blade from flapping up, and to tilt the plane of rotation, and the Total Rotor Thrust, forward to make it go forward. The pilot uses cyclic to make the advancing blade flap down, and the retreating blade flap up. If no cyclic is used, yes, the advancing blade flaps up in the relative wind, the plane of rotation / disc / disk / frisbee tilts back, and the aircraft moves back. Until the relative wind from the back changes the flapping, and it does a couple more cycles and crashes. I am curious about the tradeoffs involved there. Not much info on "overslung" rotor systems.I am curious about the tradeoffs involved there. Not much info on "overslung" rotor systems. You shouldn’t over think the design. Underslung/overslung, all we’re trying to do is eliminate, as much as possible, unwanted acceleration forces at the hub, governed by the law of conservation of angular momentum, by ensuring the distance between the center of mass of each blade and the rotor mast remains constant, regardless of rotor tilt. *Also, check out a post back in Jan. 2011: Soft-in-plane Rotor System. What? Edited by iChris, 13 October 2018 - 13:17. Yeah, I realized just after posting that how silly an "overslung" hub would be. Like if you inverted the normal underslung hub so the tettering hinge was below the plane of the rotor disc. You'd basically have a flexible shaft then, and the "correction" applied when the blades flap would be in the wrong direction. The shaft would want to whip and the rotor would tend to whirl about the shaft axis pretty vigorously. I don't think you'd be able to fly a helicopter with a hub like that. Do you have a copy of Principles of Helicopter Flight? Chapter 12, Forward Flight, directly contradicts you. Particularly the section under the heading "Eliminating Dissymmetry of LIft". Thoughts? Principles of Helicopter Flight? Chapter 12, Forward Flight, directly contradicts.. Particularly the section under the heading "Eliminating Dissymmetry of LIft". Thoughts? Read it again, lots of confusion on this, you need to go back and really understand that assumption. 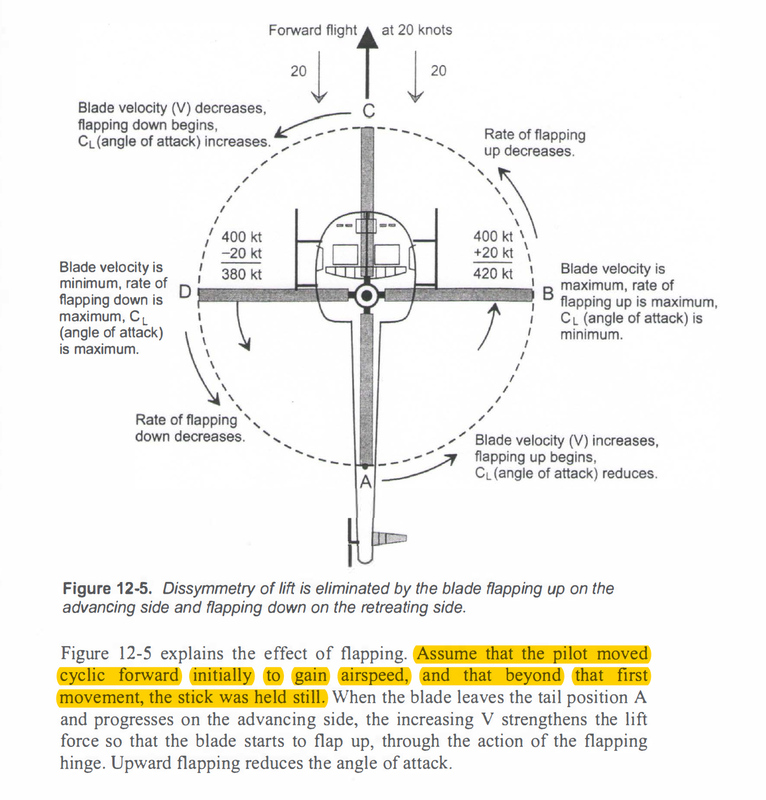 That description does not represent a helicopter in sustained forward flight at a constant airspeed and altitude. in other words, the pilot must do something in order to sustained forward flight at a constant airspeed and altitude. Let us know what you find/learn. Also, this reaction is documented in Ch. 21 under “Longitudinal Stability” or aka "Speed Stability." Edited by iChris, 15 October 2018 - 14:43. Does figure 12-5 depict sustained forward flight? I think you're misinterpreting that. If I'm flying straight and level at 90 kts, will I run out of fuel or forward cyclic movement range first? Assuming full tanks at takeoff. To start moving forward, you have to feed in a little forward cyclic. it starts to move, but then flapback wants to raise the nose - you add a bit more cyclic to hold it down. You are now at a steady 10kt. You want to go faster, lower the nose a little (forward cyclic) and it accelerates, but again the nose wants to rise - hold it down with more forward stick, and now you are at a steady 30kt. For each speed change, there is an initial forward cyclic movement, and then another forward movement to hold it there, stopping the flapback. The faster you go, the more forward cyclic you need, not just to accelerate, but to hold the speed. Eventually you would reach the cyclic limits, it will accelerate to a higher speed but flapback will then raise the nose and you slow back to your previous high speed, as you have none left to hold it there. No, it shows the initial movement after some forward cyclic has been fed in and then not moved again. It shows that the advancing side has more lift than the retreating side, and if the pilot does not correct it, flapback will occur, the nose pitches up, and the dynamic instability in pitch thing happens. 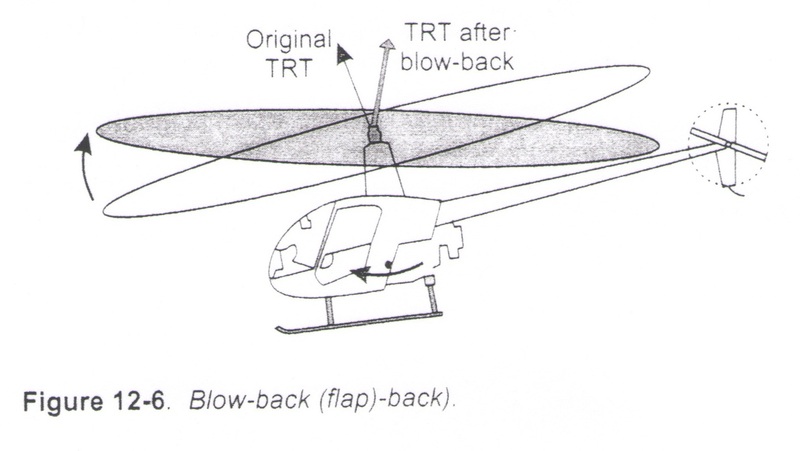 Since the helicopter possesses static longitudinal stability, if that is accomplished as described, the helicopter we react as seen in the photo below (figure 12-6). That’s the flap-up that figure 12-5 depicts. Finally, as a result of the cyclic being held still, the helicopter will soon come to a stop. This is due to the helicopter’s longitudinal stability (aka speed stability) which works to return the helicopter to its prior state of Equilibrium. Edited by iChris, 27 October 2018 - 13:13.